You are browsing the archive for 2017 December 13. In a special election on December 12, 2017, Alabama chose Democrat Doug Jones over Republican and alleged sexual predator Roy Moore. Jones will now head to the U.S. Senate, bringing to a close an election that drew national and international attention—unusual for a state election, but even more so for Alabama. Much of the media attention on Jones, the first Democrat elected in the state in a quarter century, focused on his role in prosecuting Ku Klux Klan members who had planted a bomb that killed four girls at a black church. The terrorist attack occurred on September 15, 1963, when a bomb went off at the 16th Street Baptist Church in Birmingham, Alabama. The church was a known meeting place for Civil Rights organizers, and was targeted for that reason. 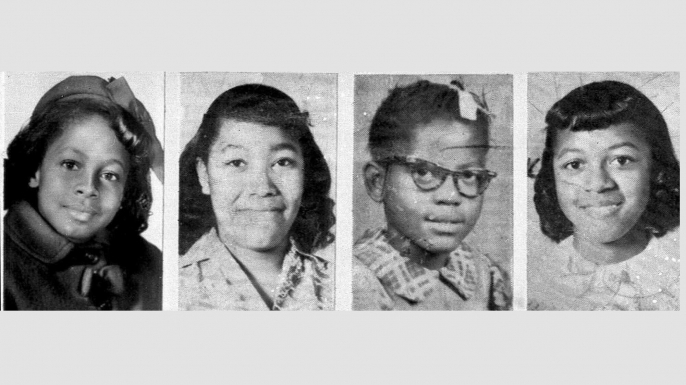 The bomb injured at least 20 people and killed four young girls: Addie Mae Collins, Cynthia Wesley, Carole Robertson, and Carol Denise McNair. According to Glenn D. Brasher, a history professor at the University of Alabama, the FBI determined that four KKK members had planted the bomb. FBI agents, then led by Director J. Edgar Hoover, knew the attackers’ names, and had even made secret recordings to prove it. However, “the FBI under Hoover sealed those files away, because J. Edgar Hoover was not exactly a proponent of the civil rights movement,” Brasher says. By doing this, Hoover ensured that a court could not use them as evidence to prosecute the attackers, making it more difficult to convict. For 14 years after the bombing, none of the men were prosecuted for their crime. The first one to be arrested (and convicted) was Robert Edward Chambliss in 1977—whose trial a young Doug Jones attended when he was in law school. Chambliss “was prosecuted largely on circumstantial evidence,” Brasher says. “The prosecution didn’t have access to all of the information that the FBI had collected immediately after the attack in the ‘60s.” Nevertheless, the overwhelming circumstantial evidence let to a conviction. While I don't support tax increases as a matter of principle, the arguments I heard for defeating the proposal were not very convincing. Most advocates for increased public funding of science, technology, graduate programs, and higher education more generally simply assert that their favorite projects are vital to the well-being of humanity. I saw multiple social media posts and similar items explaining that a PhD student on, say, a $20,000 annual stipend cannot possibly afford the taxes on the value of a $50,000 tuition waiver. “I would never have completed my degree!” say the professors. “I would have to drop out!” say current PhD students. OK, but how is that an argument against the tax bill? No part of the economy seems as convoluted as the health care sector. It comprises a vast array of services and procedures, and is usually embedded in a complex legal framework, influenced by powerful interest groups and state monopolies. Medical expertise, gained over years of education and training, seemingly invalidates consumer choice. The complexities of health disorders and its terminology further dis-empower the individual from understanding and autonomous decision making. On the other side, strong emotions act as a driving force, too. The fear of suffering and inaccessible care leads to a demand for safety in the hands of experts who ideally act under a medical ethos. It is probably our deepest fear as humans to become ill and not receive care, to deteriorate, face job loss, or even social exclusion. And of course, in the face of suffering one does not want to be at the mercy of profit-driven experts. Finally, neoclassical economists utilized the arguments of market failure (information asymmetry, uncertainty of outcomes, the principal-agent problem, moral hazard etc.) to claim health care is unsuitable to markets. Demands for government controls soon followed. "Hey California, Stop Telling Us What to Say at Work!" scrutiny, a relatively deferential standard. promote programs that they morally oppose. Accordingly, in National Institute of Family and Life Advocates v.
obligation to communicate their expertise fully and truthfully. have the same specialized knowledge as their medical providers. be to encourage more of it? their managers and clerks from being robbed and assaulted. It’s all being rationalized in the name of social justice. Watch for the idea to show up in New York, too. means they’re supposed to have 30 seats and serve food. and clerks from being robbed and assaulted. aren’t the only things on her mind. Well, it sends several messages. threatened with violence have the right to protect themselves. assault — is playing pretend.